If you’re like me your pet’s comfort is paramount. And since my pets, sleep on average of 16 hours a day, I want the very best bed for them. But, as you know a good dog bed can be very expensive. So, I have to be honest, I’m looking for the bed that is the right size, right color, right comfort and the right price. I did check out various websites and choose from their selection of very affordable beds. Most of the beds were plush, or had wire frames and stylistically did not impress me. But from the picture and description I did choose the K-9 Keeper Sleeper from Four Paws. The price was right at $40 (plus shipping), as was the size 37″x 25“. Immediately I was unimpressed. Mostly because this is not a dog bed at all but a machine washable pad that is well designed for a crate. There was no stuffing, and the fleece was flat. On a good note, my cat did find the K-9 Keeper Sleeper a fun play pad for about 5 minutes. My dog Champ, however, has opted to sleep next to the K-9 Keeper Sleeper on the floor in the corner. I think as a crate pad, and especially with the heat pad insert that is an optional purchase, this could be a good purchase. 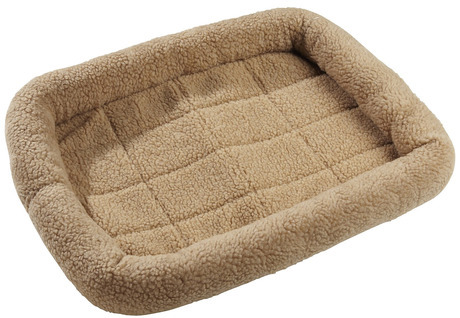 However, do not buy the K-9 Keeper Sleeper as a bed.